After Barberà del Vallès, the next tournament on my calendar was in Balaguer. I’ve had good experiences in Balaguer, having made my last two GM norms in 2006 and 2007 there. In 2006, I was in contention for first place until a last-round loss to GM Azer Mirzoev. But in 2007, that final GM norm came with a tie for first place with GM Alexander Delchev. Unlike my previous tournaments in Barberà and Montcada, Balaguer is a single section tournament, so in the first round, there are huge rating mismatches. Still, my on-and-off form was on display in the first round against Jaime Parramon (1963 FIDE). Parramon responded to my French Defense with the Wing Gambit. At first I accepted the pawn, but I gave the pawn back in order to quell his hopes of a simple initiative (that’s how White’s c-pawn ended up on d4 – I played …d4 at some point and he played c2-c3xd4). 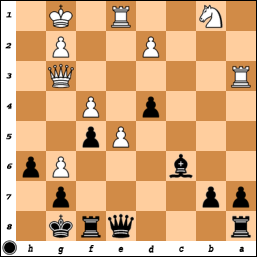 White’s structure, though, is teetering now and I could have increased my advantage very simply with 13…a6. Retreating the bishop allows …Nxe5, while after 14.Bxc6 Bxc6, White will not be able to hang onto his d4-pawn after …Nf5. I saw this, but thought I could get the same thing with 13…Nf5?. 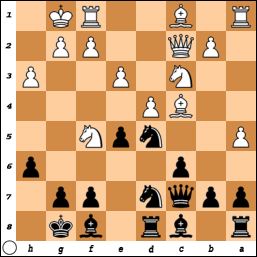 Black is threatening 14…a6 again, with the same ideas of a discovered attack. I realized right after I played the move that I was allowing 14.d5!, which sacrifices the doomed pawn, but also cuts down my bishop along the way. 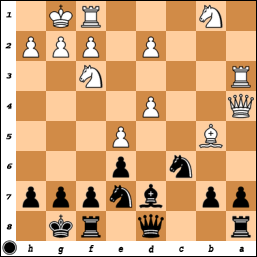 After 14…exd5 15.Bxc6 Bxc6 16.Qf4 Bd7 17.h4, White had achieved more counterplay than he could have dreamed of after 13…a6. I managed to regroup and again put a stop to his attacking ambitions, and now I finally got myself on track and started attacking a bit myself. 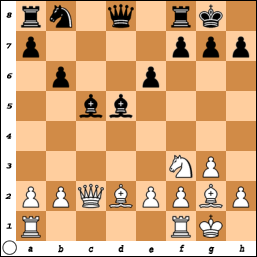 White’s g6-pawn is an obvious target, as the queen is the only piece that can guard it. 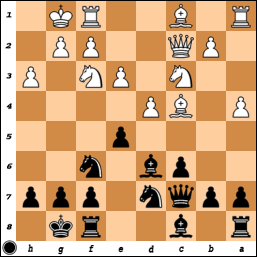 I could win the pawn with …Qe6 and …Be8, but the bishop is useless on g6. I could also try for …Qd7, …Rfe8, …Re6, and …Qe8, but that is rather slow. The quickest, and strongest, route is via a6! 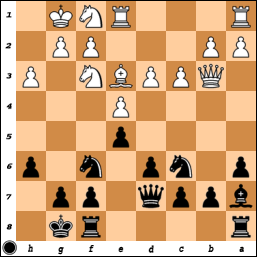 With 24…a5!, I opened the 6th rank for my Ra8 to swing across, while also setting my queenside passers in motion. Had he played 25.Rd3, then 25…Rd8 is simple and strong. The queenside pawns are now free to advance, and White’s Nb1 is still doing nothing. Instead, he played 25.Rc1 Ra6 26.Rd3, but with 26…Bd5, Black’s rook is going to take on g6 with tempo and White’s position falls apart. In the second round, I was white against Diego Del Rey (2395 FIDE). Black has just recaptured on c5 with his bishop. Structurally, Black is doing fine. His only problem is with his development and this means White has to act quickly.